Balance sheet (also known as the statement of financial position) is a financial statement that shows the assets, liabilities and owner’s equity of a business at a particular date. The main purpose of preparing a balance sheet is to disclose the financial position of a business enterprise at a given date. 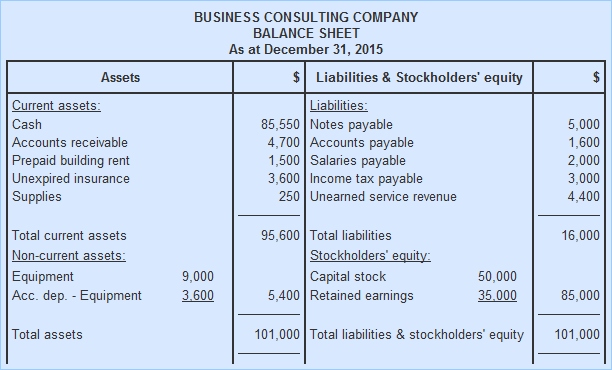 While the balance sheet can be prepared at any time, it is mostly prepared at the end of the accounting period. Most of the information about assets, liabilities and owners equity items are obtained from the adjusted trial balance of the company. However, retained earnings, a part of owners’ equity section, is provided by the statement of retained earnings. In this section all the resources (i.e., assets) of the business are listed. In balance sheet, assets having similar characteristics are grouped together. The mostly adopted approach is to divide assets into current assets and non-current assets. Current assets include cash and all assets that can be converted into cash or are expected to be consumed within a short period of time – usually one year. Examples of current assets include cash, cash equivalents, accounts receivables, prepaid expenses or advance payments, short-term investments and inventories. All assets that are not listed as current assets, are grouped as non-current assets. A common characteristic of such assets is that they continue providing benefit for a long period of time – usually more than one year. Examples of such assets include long-term investments, equipment, plant and machinery, land and buildings, and intangible assets. When balance sheet is prepared, the current assets are listed first and non-current assets are listed later. Liabilities are obligations to parties other than owners of the business. They are grouped as current liabilities and long-term liabilities in the balance sheet. Current liabilities are the obligations that are expected to be met within a period of one year by using current assets of the business or by the provision of goods or services. All liabilities that are not current liabilities are considered long term liabilities. Owner’s equity is the obligation of the business to its owners. The term owners’ equity is mostly used in the balance sheet of sole proprietorship and partnership form of business. In a company’s balance sheet the term “owner’s equity” is often replaced by the term “stockholders equity”. When balance sheet is prepared, the liabilities section is presented first and owners’ equity section is presented later. There are two formats of presenting assets, liabilities and owners’ equity in the balance sheet – account format and report format. In account format, the balance sheet is divided into left and right sides like a T account. 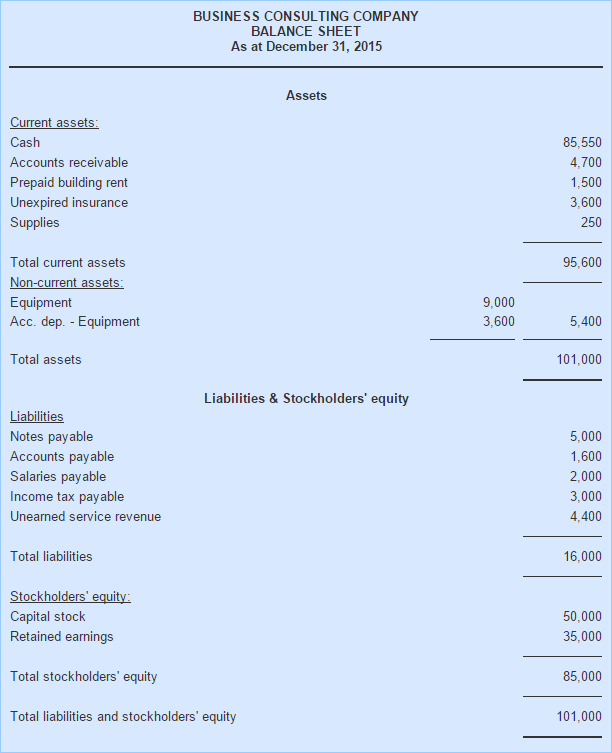 The assets are listed on the left hand side whereas both liabilities and owners’ equity are listed on the right hand side of the balance sheet. If all the elements of the balance sheet are correctly listed, the total of asset side (i.e., left side) must be equal to the total of liabilities and owners’ equity side (i.e., right side). In report format, the balance sheet elements are presented vertically i.e., assets section is presented at the top and liabilities and owners equity sections are presented below the assets section. The example given below shows both the formats. As described at the start of this article, balance sheet is prepared to disclose the financial position of the company at a particular point in time. This information is of great importance for all concerned parties. For example, investors and creditors use it to evaluate the capital structure, liquidity and solvency position of the business. On the basis of such evaluation, they anticipate the future performance of the company in terms of profitability and cash flows and make much important economic decisions. Many items have great financial value and may be important for the users of financial statements in making reliable decisions but are not reported in the balance sheet because they cannot be objectively measured. Examples of such items include the skill and knowledge of an IT company, a sound customer base and high reputation etc. The current fair value of various assets and liabilities may be important for some decision makers but the balance sheet does not disclose it because assets and liabilities are mostly reported at their historical costs. The value of some items is reported in the balance sheet on the basis of judgments and estimates. For example the depreciation is usually calculated on the basis of estimated life of the assets. The book value reported in the balance sheet is therefore also an estimated value. Another example is the accounts receivable that are reported at their estimated net realizable value. Pl show & guide me how to segregate the different head of accounts in the groupling like-CURRENT ASSET,CURRENT LIABILITIES,INDIRECT EXPENSES,DIRECT EXPENSES,DIRECT INCOMES,INDIRECT INCOMES ETC. Too good explanation and you have covered all aspects of the topic in a very good manner. I wish you success all the time. which things are not include in balance sheet???? But i need some more explanation like CURRENT ASSET,CURRENT LIABILITIES,INDIRECT EXPENSES,DIRECT EXPENSES,DIRECT INCOMES,INDIRECT INCOMES ETC. i want tohelpin making balance sheet of a business man or a proprietorship or acompany. Read all the chapters of this website. Please tell your friends and fellows about our website if you like our material. kindly give us the actual format. perfect explanation. i have really understood it. Excellent explanation I think am ready for my test. good conduct.I like it and understood the concepts exactly much thanks to staff members!! Thanks helpful explanation for what are complex concepts. I like your Explanation about balance sheet statement but, as you know when prepared any financial statement based on their company because of business organization can be classified as manufacturing,merchandising and service. so each business organization doesn’t prepare the same financial statement.Anyways I want to ask sincerely to distinguish which financial statement in which business organization .